Which turned out to be a surprisingly shrewd move on my part. You see, back when I bought it California’s state sales tax was 5%. On April 1st, however, as part of the compromise package designed to repair our $14 billion (or whatever) state budget deficit, the sales tax rate went up to 6%. 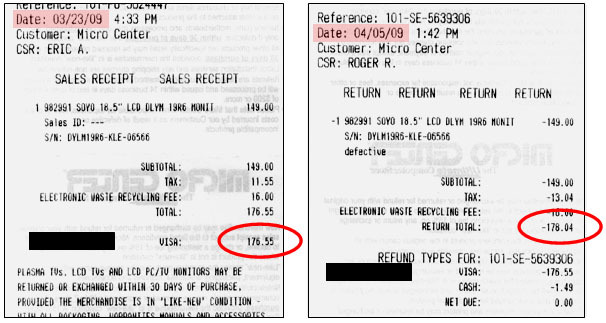 So when Micro Center’s automated refund software calculated how much it owed me, it recalculated the sales tax and decided that in addition to the $176.55 I originally paid via credit card, I was owed an additional $1.49 in cash (see photographic evidence below). The guy running the register, wisely recognizing that it was futile to argue with the machine, just laughed and handed me the extra dough. Feeble-minded cash register software aside, I have to say that it speaks well for Micro Center that they didn’t waste my time or theirs fussing over this. Which didn’t surprise me. In fact, I do all my computer shopping there precisely because, unlike Fry’s, which deliberately makes the return process as painful as possible, Micro Center has never given me any hassle at all on the rare occasions when I need to return something. So credit where it’s due. And, apparently, even where it’s not.